Living in Canada I have been pretty lucky to be able to experience a society that is full of a mishmash of cultures. I have seen the positive influence of other foods, artwork, clothes, religions and ways of life. I’ve seen people embracing their favourite bits of different cultures and creating something new and beautiful. I’ve also seen a darker side of the culture clash; neighbors fighting about opposing views and whole communities ostracizing those with a different belief system. I would say that these are both common phenomena around the world today. With the ability to travel as far and wide as we do, it’s easy enough to pick up and move to the other side of the world. Blended communities, towns and even countries are the norm nowadays, forcing people to deal with other cultures whether they want to or not. Imagine though, if you will, a city that doesn’t accept the new blended status quo; a city that doesn’t want to blend, doesn’t want a mixture of cultures, of people, of foods or architecture or clothes, even colours. A city so divided that it literally divides. Imagine living in this city where two different cultures exist, but are so separated and divided that they remain unseen by each other. You see your town, the others see their own, and you all agree to ignore, to unsee what doesn’t belong to you. Neighbours can exist side by side, but the rift between them is as big as the biggest ocean. They never see each other, and do everything they can to avoid even knowing the other exists. If this all sounds ridiculously complicated, well… that’s because it sort of is. This is actually my second time reading China Mieville’s The City & the City. I started reading it ages ago and was so confused I needed to put it down. The synopsis states right off the bat that there are two parallel cites living in the same space, but it’s hard to tell whether these cities exist in a parallel universe type situation, or if they actually are just the same city. Turns out it’s the latter, and I really think that knowing that before you start this book can make a huge difference in understanding it. Once you get past the confusion though, the book drags you in; hook line and sinker. At its heart, The City & the City is a good old fashioned noir detective story. A girl has been found in one of the cities (Beszel), brutally murdered. Detective Tyador Borlu of the Beszel Extreme Crime Squad is on the scene and determined to do everything he can to avenge this girls death. Things get complicated when it turns out that the girl is actually living in the other city (Ul Qoma) on a student visa. Detective Borlu assumes that this must be a case of breach, when a person illegally goes from one city to the other, and tries to hand off the case, but the truth turns out to be much more complicated, so Borlu must team up with his Ul Qoman counterpart to solve the case. At the midway point, Borlu has just crossed into Ul Qoma and is getting to know his new partner, Qussim Dhatt, and they have discovered that another girl may be missing. I have no idea who the murderer may be, but it’s not something that I am fretting about like I normally would. I am thoroughly enjoying the ride this book is providing. I love the gritty aspects of the murder story; Beszel is run down and gritty itself, creating the perfect atmosphere for murders and mayhem. Borlu is a great character, we are learning enough of his backstory to flesh him out, without being overwhelmed, and he is enough of a rebel to create a little excitement without going overboard. He talks constantly about all the things that he ‘unsees’ which goes a long way to help the reader understand the dynamic between the two cities. I also love, LOVE the world that Mieville has created with Beszel and Ul Qoma. Beszel, as I said earlier is more run down and seedy; Ul Qoma is prosperous and clean. The difference reminds me of walking downtown in any decently sized city and ignoring the seedy underbelly that no respectable citizen wants to acknowledge. We ignore, or unsee, the homeless, the dirty and shabby, those down on their luck, the crumbling buildings and empty storefronts, covered in graffiti and broken glass. 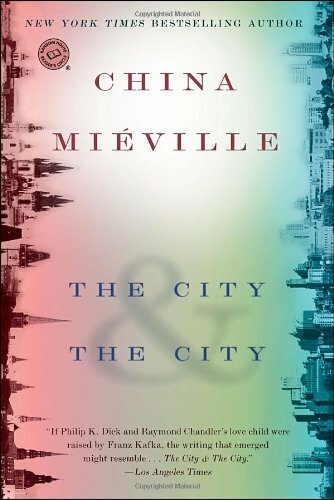 Mieville has fully imagined the technicalities that a divided city like this would require. There are areas that are mostly one city or the other, and then areas that they share – crosshatched – where it’s easy to see the wrong thing, or walk into the wrong building. There is the mysterious force “Breach” which controls and oversees all pertaining to the divide of the two cities. Go where you are not allowed and you may never been seen again, but everyone will know that Breach got you. The City & the City may start out complicated, but it with a little patience I promise you won’t even remember your confusion after a while and will get sucked into the mystery. I am really hoping that that last half of this book follows the same path – as long as I don’t see the wrong thing, of course.